We had a really yummy red lentil and tomato soup at the cafe at Newton Dee on Saturday and even Daniel expressed his approval so I thought I’d trying making one for lunch today. Lentils are a great source of protein and iron, and they’re also very cheap. My soup was yummy and it passed the Daniel test. You don’t need to soak red lentils before cooking them and they usually only require about 20 – 30 minutes of simmering before they’re soft and ready to eat. I cook with ginger quite a lot and so I keep a large piece of fresh ginger in the freezer and grate off parts of it from frozen whenever I need some. Chop the onion and fry in olive oil for about 5 minutes. Then add the garlic and spices and fry for another minute or so. Add the lentils and lots and lots of water along with everything else. Simmer for about half an hour until the lentils are soft and mushy. Serve with croutons or crusty bread for dipping. 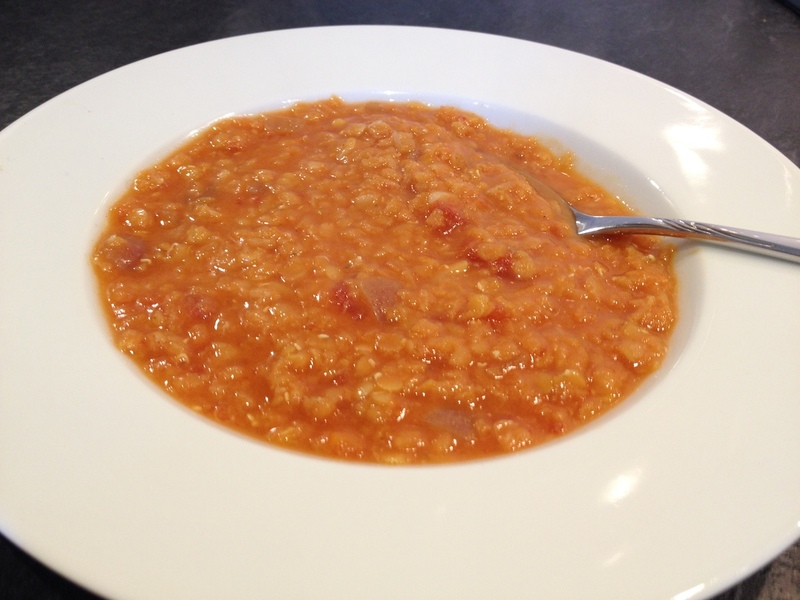 Posted in Recipe and tagged ethics, lentils, recipe, red lentil soup, soup, Vegan, vegetarian. Bookmark the permalink. Ahhh, I need this now. It looks terrific & delicious! 🙂 Love all the spices it calls for. That looks so nice! The magic with lentils really is in adding the ginger, as well as the other spices.